Google Chrome offers you to save your web passwords so that you don’t need to remember them. The browser didn’t have a proper in-built option to export passwords saved in the Chrome browser. 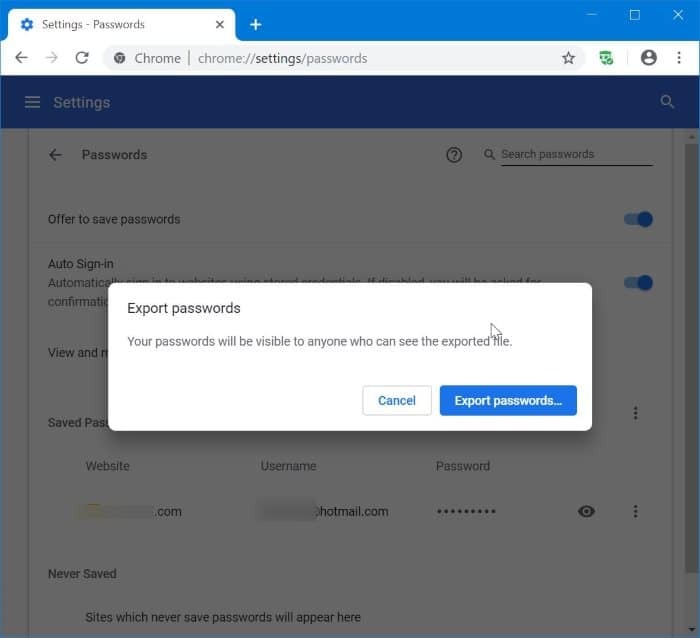 Luckily, the newest version of Google Chrome browser offers an easy option to export passwords saved in Chrome. This means that you don’t need to use any third-party software or extension to backup Chrome passwords. 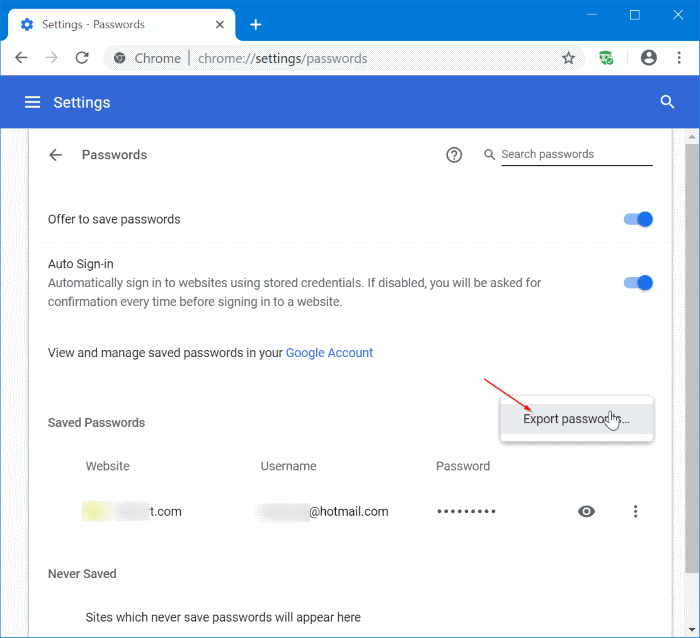 If you are looking for a way to backup or export your stored passwords from Google Chrome browser, there are three ways out there. You can use any of them to export passwords saved in Chrome browser. Step 1: Run the Chrome browser. Click on the user icon on the toolbar and then click the Passwords option. 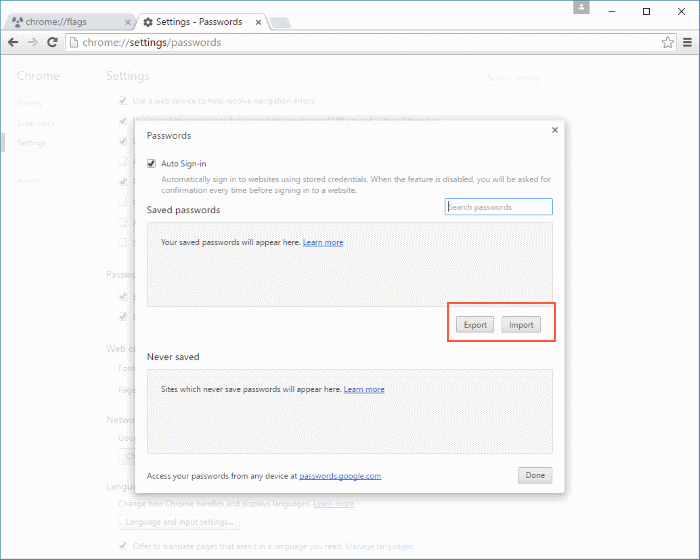 Step 2: The Saved Passwords section shows all passwords saved in the Chrome browser. Click the More icon (three vertical dots) next to it and then click the Export passwords option. Step 3: When you get the following dialog, click Export Passwords. Step 4: If you are asked to enter your Windows account password, please do so. 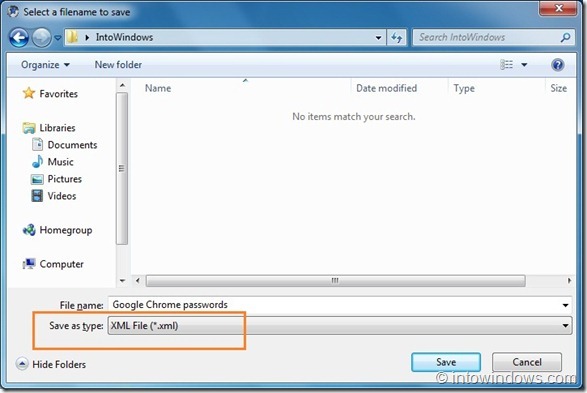 Select a location to save the file containing Chrome passwords. 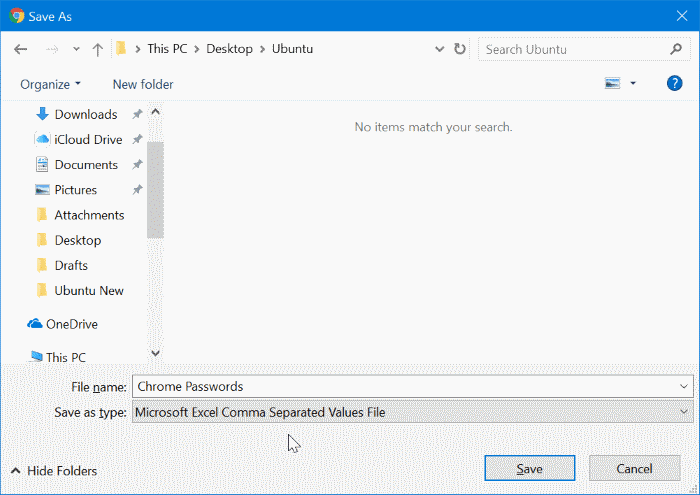 Chrome uses Microsoft Excel Comma Separated Values File format to save exported passwords. Please make sure that you’re running the latest version of Chrome browser to get the Import/Export option. Step 1: Open Chrome://flags in your Chrome. Step 2: Find Password Import and Export option, select Enabled from the drop-down box, and then restart the Chrome browser. Step 3: Now, open Chrome://settings/passwords page. Step 4: Click on Export button to export/backup saved passwords. 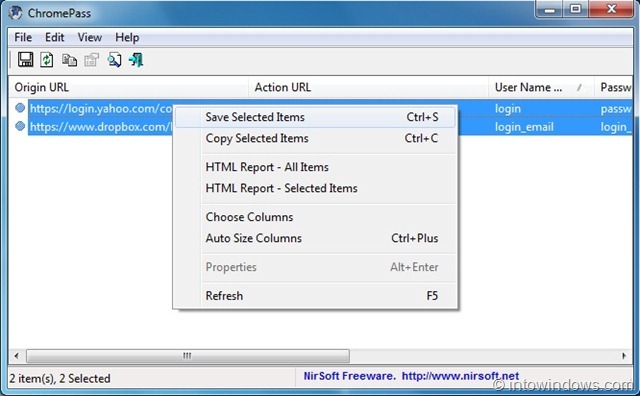 Click the Import button to restore previously saved passwords. Step 5: Enter your Windows account password, when asked. Step 1: First, download the ChromePass tool. 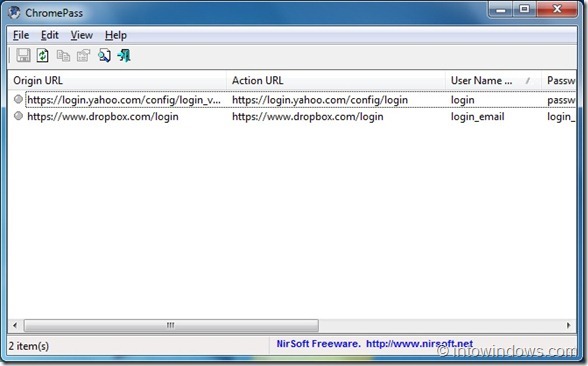 It’s a free tool that displays saved passwords in Google Chrome browser. The best thing about this free tool is it even lets you export these passwords in an XML, HTML file format. 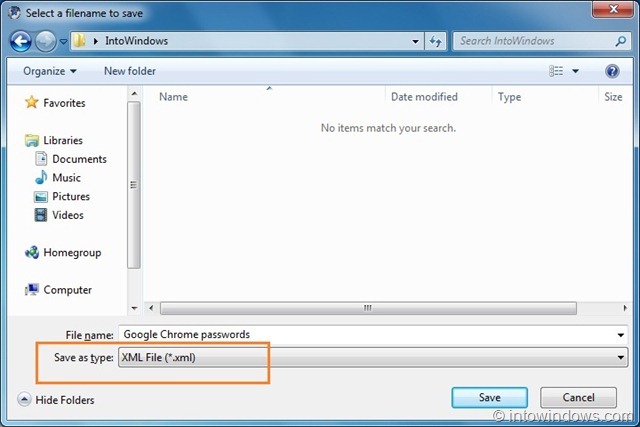 Step 2: Extract the downloaded zip file to the desktop, and then run the ChromePass tool to view all saved passwords in Google Chrome. Click on the refresh button to get the up-to-date list. Step 3: Select all the passwords. Go to File, select Save selected items, and then select the file type that you want to use to store these passwords. Finally, enter a name to the file and click the Save button to save the passwords in the selected file format. There is problem of link chrome://settings/passwords! I have enabled password imports but this link does not show any pop up to download any excel sheet! IRON Versión 61.0.3200.0 does not allow any method to import. does not display the popup that had the option to import / export. I would like to know if this new functionality is due to the new version of chromium? Or is it because the IRON SRWARE programmers removed this option? chrome: // flags / # password-import-export, does not display the popup that had the option to import / export. Nope, even with all those changes there is **STILL** no export button. Guess Google fubarred the browser yet again. 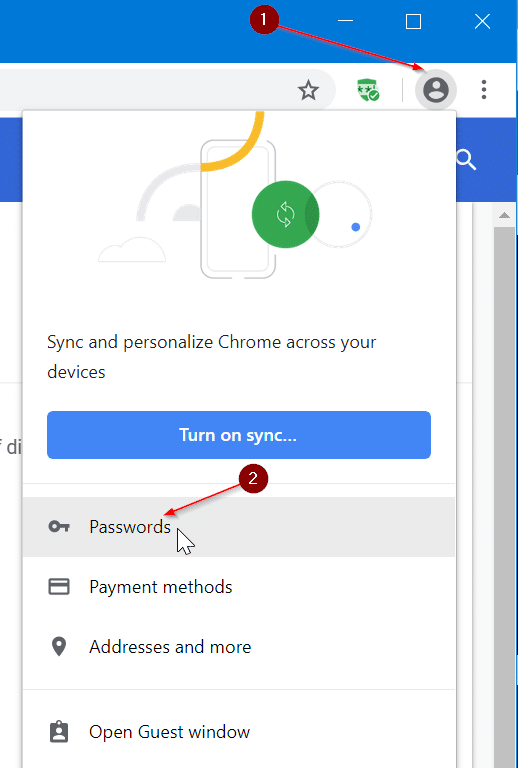 It is incomplete post..there is no info on how to restore passwords back to chrome.. It is again pushing user to do manual work..not making there life easy.. Does any one has a better and complete solution for passwords import and export in chrome browser for WIN 10 ? If anyone can help, I need the path and name of the actual saved password file so I can recover it from a trashed disk partition to hopefully restore it to my present instillation. I was trying to fix the MBR and my win7 disk formatted the drive instead. Which means the above two recovery methods are not viable solutions. :( ouch! any help much appreciated. Oh and yeah, I agree with Pccapso. Any AV should pick that program up as being infected, as it does something which if any other program did, you would definitely have an infected system. “it was detected as a Hacker tool!”. It is a hacker tool, not a virus. Relax. For anyone else with malware concerns, i cannot vouch for the program or developers, but the program takes and decrypts your stored passwords to export them which is what you want. Any anti viris worth its salt should detect and warn of this behavior because a malicious program would use the same method to steal your passwords, but in this case that is what you have the program for so the alert is a false positive. I would be more worried if an Antivirus did not trigger on it because that would mean that the Antivirus is crap. How I can restore the file .xml or a file .txt? This software don´t show any option for it. How I can Restaur this file XML? This software don´t show any option for it! I would not suggest this, as I downloaded then scanned this program for virus, and it was detected as a Hacker tool! anyway to restore the password & username !! Chrome identifies ChromePass as malware, so something is going on there. Find another solution!